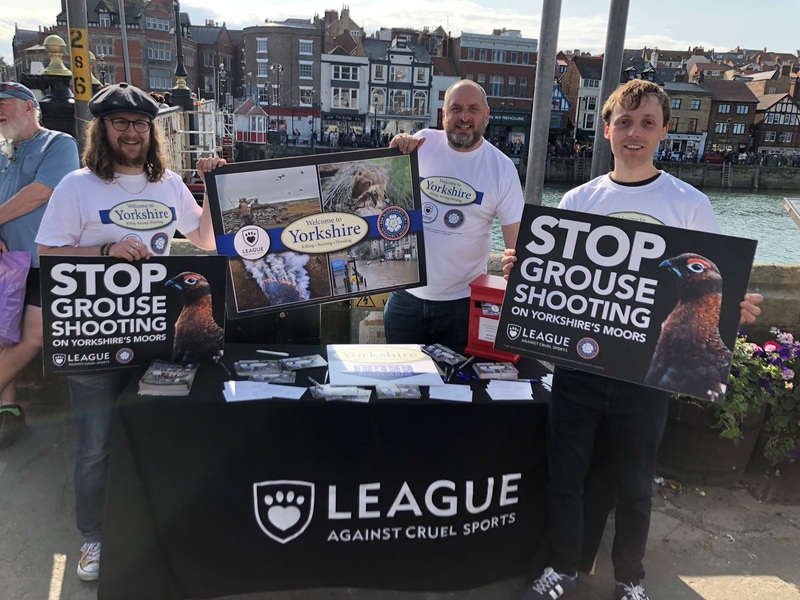 Yorkshire, UK – Campaigners have held a weekend of action in four Yorkshire Coast towns as part of a campaign urging Yorkshire Water to stop leasing moorland for grouse shooting. Yorkshire Water – one of the region’s largest landowners – is being urged to stop leasing moorland for grouse shooting, with over 1,000 people signing petition postcards to the utility company in Whitby, Scarborough, Filey, and Bridlington during a weekend of action over the Bank Holiday. Grouse shooting on Yorkshire Water moors is causing considerable damage to wildlife, habitat and the Northern regional economy. Native wild animals – including stoats, weasels, foxes and corvids – are purged from the uplands by trap and gun to engineer large numbers of game birds for shooting parties. Large sections of heather are burnt for the same purpose – a practice which degrades peatland and contributes to flooding in the valleys below.